Kopřivnice, a town with more than twenty thousand inhabitants, is located in north Moravia in the Beskydy Mountains. It is squeezed in a valley between two hills - Red Stone and White Mountain. These natural dominant features are also symbolically captured in the form of color in the emblem of the town. The decision to build Šostýn Castle on the slopes of Red Stone was essential for today's town, although the castle is now a ruin. In its time Šostýn - as well as neighboring Štramberk Castle or the much larger and more important Hukvaldy Castle - fulfilled the role of guardian of a trade route leading through the Moravian Gate – the so-called Amber Route. Kopřivnice can be grateful for several important decisions and events that helped it become an important industrial town from a small settlement under Šostýn. First of all, two important Kopřivnice families. The Raškas and the Šustalas. The first one stood behind the establishment of an earthenware factory, which was famous in their time, that produced its products, eg. ceramics, pottery, tiles and tiled stoves, the entire 150 years. The second family is associated with the commencement of production of horse-drawn vehicles. It began in the workshop at the former hereditary reeve and over time, in new spaces and thanks to the connection with the Raškas, it developed into its current form, into the factory now known under the brand Tatra. Very important historical moments of the town are captured in today's Reeve's House Museum (Muzeum Fojtství), which was established in the original reeve's house next to the aforementioned workshop. In the Technical Museum Tatra in the town center, an attractive exposition captures the history of Kopřivnice factory, later Tatra car factory. During the tour you will discover a number of rare exhibits and meet with a wide range of the factory‘s production. In the past, the company didn't produce only trucks as today, but also cars, railroad cars, airplanes and some other unique items. The museum also has a replica of the first car produced in Austria-Hungary or a national technical monument – the motor railcar "Slovenská strela" (Slovak Arrow). Although Kopřivnice was promoted to a market town in 1910 and to a town in 1948, it retained its rural character long after, with timbered houses and fields. Indeed, in 1950 the town had only 6,000 inhabitants. The Tatra company boom completely changed the face of Kopřivnice, especially in the 1970s. The factory took up- and still takes up – a significant part of the town. The growth of production triggered the need for new employees and the associated need for new housing and additional services. Extensive construction activity swallowed up a piece of history and Kopřivnice took the form of a modern town with new buildings - a prefabricated house can be considered a symbol of that time. This rapid development is responsible for the present shape of the town, so you won’t find a historical square with arcades as in other towns. However, Kopřivnice has its square, although more due to its name than appearance. It is located near the current center and consists of a park with the neo-Gothic church of St. Bartholomew. 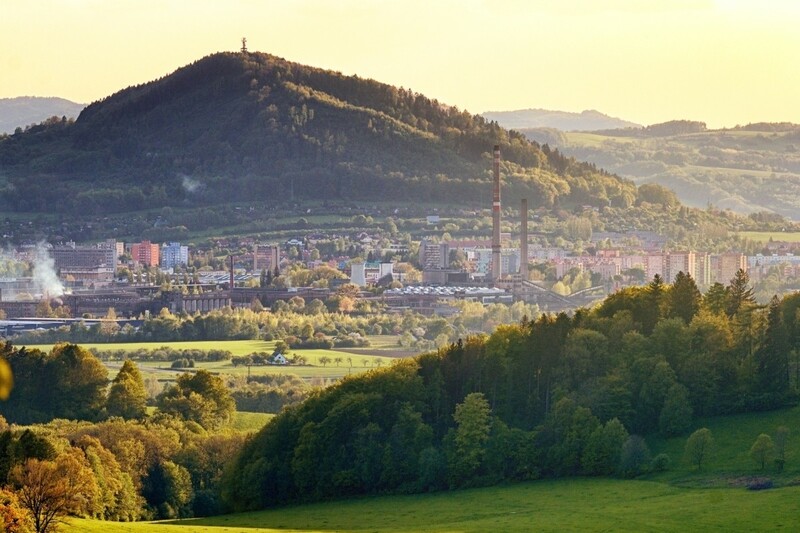 However, just take a few steps and suddenly you will find yourself out of the modern town in the amazing surroundings of the neighboring forests and meadows or in the picturesque and historic Štramberk, which connects seamlessly with Kopřivnice. While wandering around the neighborhood it is good to visit the Bezruč look-out tower or the White Mountain viewing tower. From there you will see the whole so-called Lachian Gate of the Beskydys, which besides Kopřivnice is also formed by Štramberk and nearby Freud's Příbor and Janáček's Hukvaldy. Incidentally, Kopřivnice also has its significant compatriots. Of the many we can mention Emil Zátopek, a famous Olympian and a great personality, not just in sports either. In the building of the Technical Museum, an exposition is devoted to him and his wife Dana. We can also mention Zdeněk Burian, a famous painter and illustrator who has his exposition in Šustala villa. It is located near his birthplace, the house, which was part of the former earthenware factory. And in Šustala Villa, there is also an exhibition devoted to the history of this factory. Contemporary, modern Kopřivnice is not so tied to the company Tatra. It is no longer true that the town and Tatra are one. However, the town did not renounce its automotive history. Instead it built on it, with a new industrial zone and new companies. And even today, Kopřivnice is a town of cars, but not only cars.